Colophon, said to be original, inserted after the end of the Gospel of Mark [f. 142]: "This book was finished on the 29th day after the new moon, on the 14th day, in the days of the king Na'od, in the days of our bishop Abba Marqos, in the Year of Mercy 157. And as for me, the scribe, may [God] write his name on a pillar of gold. For ever and ever, Amen and Amen." The date according to the Ethiopian calendar belonged to late 1504 or early 1505 on our calendar. Endnote in Amharic, Late 19th century hand, giving an account of the settlement in a murder case [fols. 268v-269]. 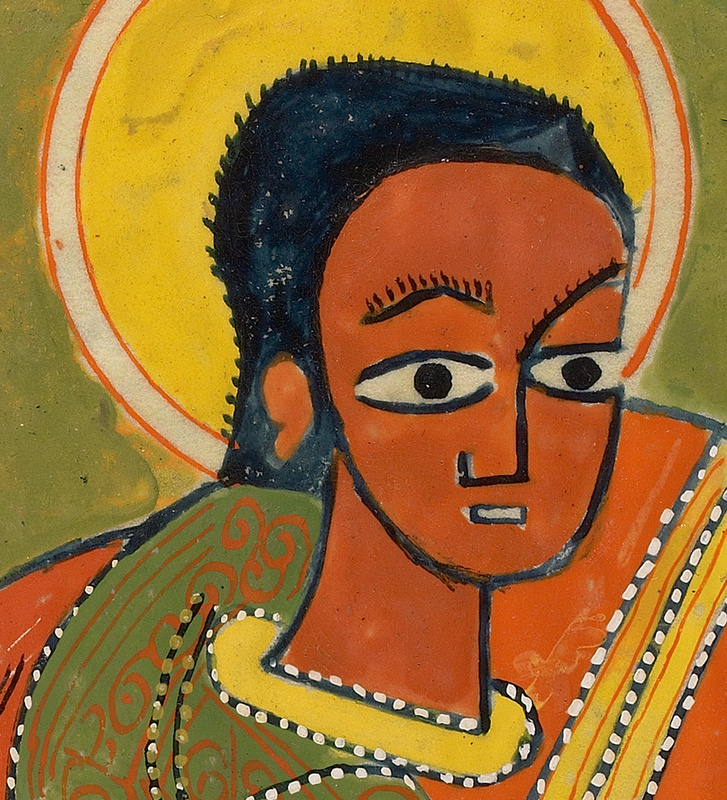 This Gospel book comes from the Christian kingdom of Ethiopia and is illuminated in the distinctive and profoundly expressive style that characterizes Ethiopian painting. Ethiopia was one of the earliest centers of Christianity. Over the course of the Middle Ages, this culture produced icons, processional crosses, and illuminated manuscripts that formed an integral part of its religious services. The manuscript is written in Ge'ez, the language of early Christian Ethiopia, which was by the10th and 11th centuries a primarily literary and liturgical language. Dating between 1504 and 1505, this manuscript begins with an intricately decorated headpiece, called a haräg (from the Ge'ez word for tendril). It continues with a striking image of the Virgin and Child and eight canon table pages. Four evangelist portraits are remarkable for their monumentality and arresting palette of olive, orange, yellow, and white. The uniformly bright hues and rhythmic distribution of circular motifs and interlace create a vibrant, unified design throughout the manuscript. This striking manuscript is illuminated in the so-called Gunda Gundé style. It takes its name from the location of the Stephanite monastery of Dabra Garzen, which possesses a number of examples of this type. The large, exaggeratedly rounded backs of the evangelists, their almond-shaped eyes and the dotted motif employed in their clothing are hallmarks of the Gunda Gundé style, which is characterized by an extreme stylization of the figures and geometric regularity. Mercier, Jacques. 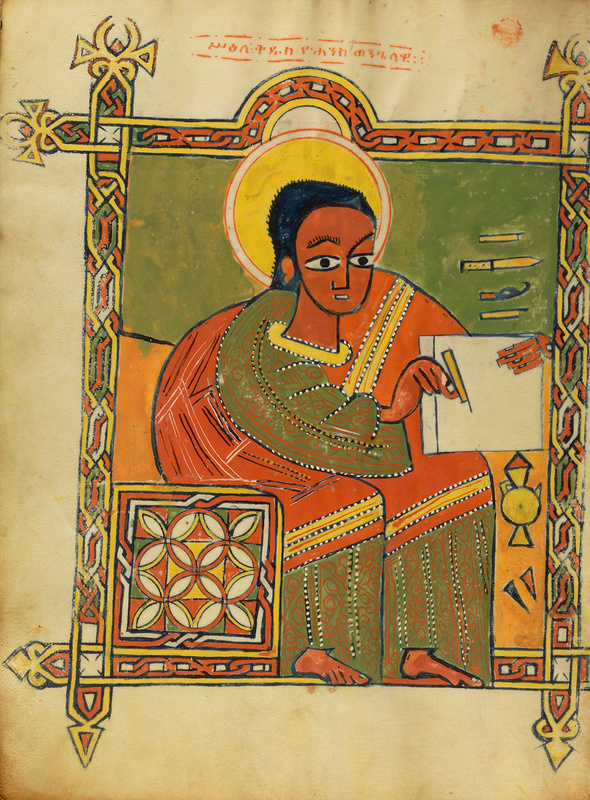 Art that Heals: the Image as Medicine in Ethiopia, exh. cat. (New York: Prestel; The Museum for African Art, 1997), pp. 82-83, no. 37, fig. 85. Mercier, Jacques. Vierges d'Éthiopie (Montpellier: L'Archange Minotaure, 2004), pp. 100-101, ill.
Fogg, Sam. Art of the Middle Ages (London: Sam Fogg, 2007), pp. 134-39, no. 41, ill.
Sciacca, Christine. Building the Medieval World (Los Angeles: J. Paul Getty Museum; London: The British Library, 2010), pp. 2, 83, fig. 81. Keene, Bryan. "Il Medioevo Globale: Visioni del Mondo al Getty Museum." Alumina 14, no. 52 (January-March 2016), p. 51, cover ill.
Keene, Bryan C. "Il Medioevo Globale: Visioni del Mondo al Getty Museum." Alumina: Pagine Miniate 14, no. 52 (January - March 2016), 46-51, p. 51, ill.